Pine needles hidden in the forest are among the debris left behind by storms from this past winter. As this year’s record-breaking winter gradually winds down, damage from the intense storms is still being discovered. The mix of snow and rain that cycled through the region left the ground soft and the trees heavy with sopping wet slush. 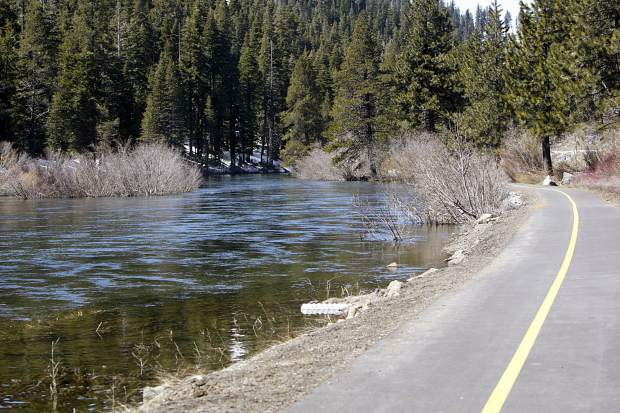 Homes and businesses were left in the dark for days when trees repeatedly fell onto power lines, but Tahoe-Truckee isn’t out of the woods yet. 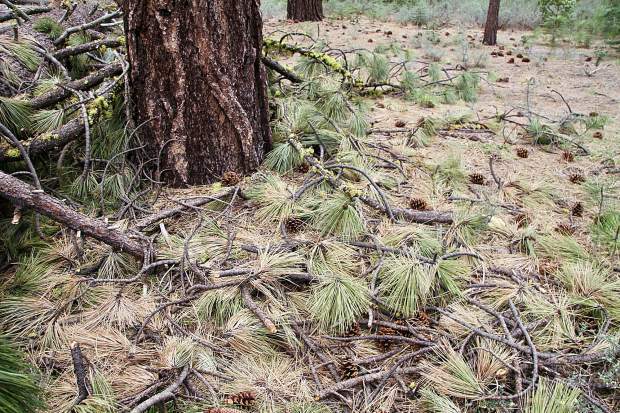 Although crews have been hard at work this spring removing debris left behind by winter storms in developed areas, the fallen trees, branches, and pine needles hidden in the forest pose a significant wildfire risk. Wildfire has been a natural part of Tahoe’s forests for thousands of years, he said. Before there were people in the area, small fires ignited by lightening used to burn brush, pine needles, and small trees regularly to keep them from building up. Pine trees, which are fire resilient, would survive. In fact, if you walk around the forested areas in the area you can find pine trees with fire scars on them, Belden said, because they have thick bark made to withstand the flames essential to their lifecycle. Pinecones cannot open up and release their seeds without being exposed to high temperatures. 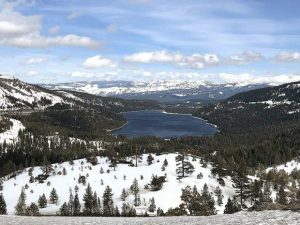 But Belden, who worked for the U.S. Forest Service prior to joining the Truckee Fire District, said that our understanding of how to best manage forests has evolved over the years. Fire used to seen as harmful, so for many years it was suppressed. The pine needles, brush, small trees lining the forest floor accumulated, and the potential for more intense wildfires grew. “These things that would naturally take care of themselves and be gone, now they just sit here,” he said. Now, our forests are full of hazardous fuels, enabling fires to start more easily, and to burn much more intensely. Pine trees now die in wildfires because the flames don’t just burn hotter than they used to — they also burn longer. When there’s enough fuel on the ground for a fire to remain burning, it will stay there and continue burning until the fuel is gone. Pine needles, dead tree branches, and brush act as kindling for wildfires, and if there are enough of them for a fire to consume, it will grow hotter and eventually begin burning big trees, like pines. Another problem is there are too many trees and other growth too close together. Historically, natural fires prevented this, but after many years of not burning, the forest is overgrown. Belden said that in areas where growth is especially concentrated, the trees compete for resources. 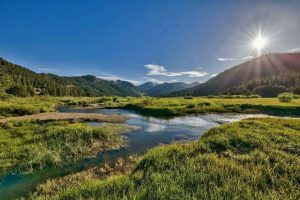 This can weaken the trees and leave them more vulnerable to risk factors including drought and the pine beetle, increasing the wildfire risk. Fires also move around, which is a problem if there is too much growth in one place. Belden explained that small, non-native trees could act as ladder fuel and enable fires to climb. When the ground is lined with downed trees, dead branches and pine needles, those will burn first, he said. The flames will move up to the overgrown brush, then to the smaller, non-native fir trees, and then to the larger pine trees. To help reverse this damage and reduce wildfire risk, controlled burns began being implemented to dispose of fire fuel. The idea is that if the dead plant matter can be burned in a controlled setting, when a wildfire starts there will be less fuel, and therefore a lower potential for it to get out of hand. “I think everyone knows why they’re doing it, they just don’t want it in their backyard.” Belden said. Every time there’s a controlled burn, he said the complaints come in. People don’t like the smell, or that sometimes their views are obstructed. There are also people who are afraid of the fire, and still think it’s harmful to the forest. Defensible space is another key factor, since many people now live in the Lake Tahoe area. California state law mandates that property owners clear 30 to 100 feet of space around any structures. This means not storing firewood next to homes, clearing any dead trees, branches, and needles. Pine needles that fall onto rooftops and accumulate in the creases create even more of a fire risk, he said, since burning embers can get caught in the wind and land on top of homes. If there are enough pine needles, he said, it doesn’t matter if the roof is fireproof. “Most homes that burn in California don’t burn because a fire’s hitting them — they burn because of burning embers,” he said. The fallen trees from this year’s storms might not be a huge problem this summer, but they are expected to be in the future as they dry out. The concern right now is dead tree limbs and needles, since those can act as fire starter. A drought plagued the region during the late 1970s, Belden said, and following those dry years there were many trees that died and fell. There was another drought cycle in the late 1980s, with several big fires, which caused even more trees to die.